Virginia is experiencing a substance use crisis of overwhelming proportions. Across the Commonwealth, 986 people died due to fatal drug overdoses in 2014. Nearly 80% of these deaths involved prescription opioids or heroin. 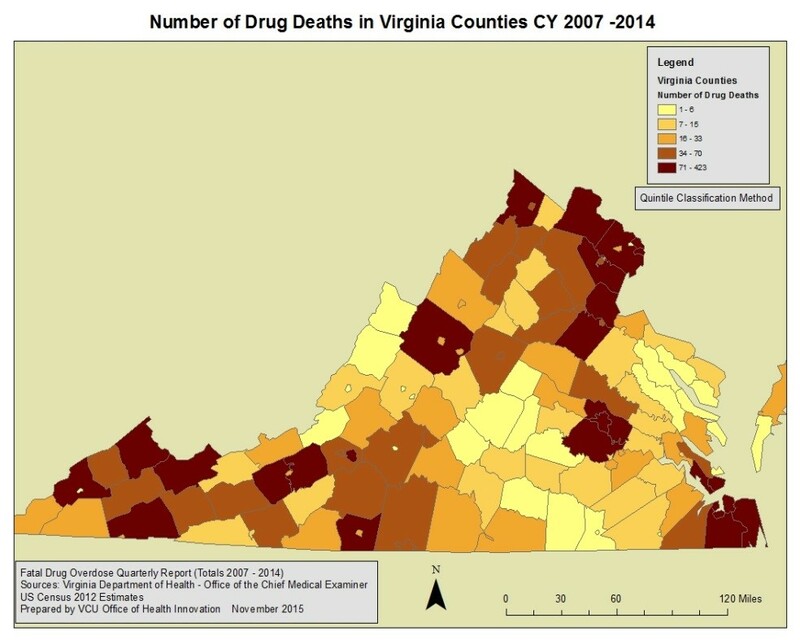 The Virginia Department of Health reported a 38% increase in deaths from prescription opioid and heroin overdoses between 2012 and 2014 with fatal drug overdoses occurring in counties and cities across Virginia (see below). The Governor’s Task Force on Prescription Drug and Heroin Abuse in Virginia proposed numerous recommendations to the Administration that were designed to strengthen the Prescription Monitoring Program (PMP) and to support providers in proper prescribing and dispensing practices. Recognizing that diversion of prescribed opiates is a major contributor to the overdose epidemic, legislation to require hospice settings to notify pharmacies of a patient’s death was also passed. Additionally, an existing regional pilot that made naloxone available to first responders was expanded statewide by the General Assembly; the same piece of legislation created an avenue to allow pharmacists to dispense naloxone under proper protocols. In the 2016 General Assembly session, several bills were passed that focused specifically on the utilization of the PMP for both prescribers and dispensers. As of July 1, 2016, Virginia law now mandates the points below. Prescribers MUST check Virginia’s Prescription Monitoring Program (PMP) before writing opioid prescriptions longer than 14 consecutive days. Medicaid MCOs may access PMP to identify members with behaviors suggesting opioid abuse or misuse. [8-31-2016] A U.S. Food and Drug Administration (FDA) review has found that the growing combined use of opioid medicines with benzodiazepines or other drugs that depress the central nervous system (CNS) has resulted in serious side effects, including slowed or difficult breathing and deaths. Opioids are used to treat pain and cough; benzodiazepines are used to treat anxiety, insomnia, and seizures. In an effort to decrease the use of opioids and benzodiazepines, or opioids and other CNS depressants, together, we are adding Boxed Warnings, our strongest warnings, to the drug labeling of prescription opioid pain and prescription opioid cough medicines, and benzodiazepines. Source: VCU Department of Health Behavior and Policy. Available at http://hbp.vcu.edu/media/hbp/policybriefs/pdfs/Senate_OpioidCrisisPolicyBrief_Final.pdf. Accessed May 9, 2017.